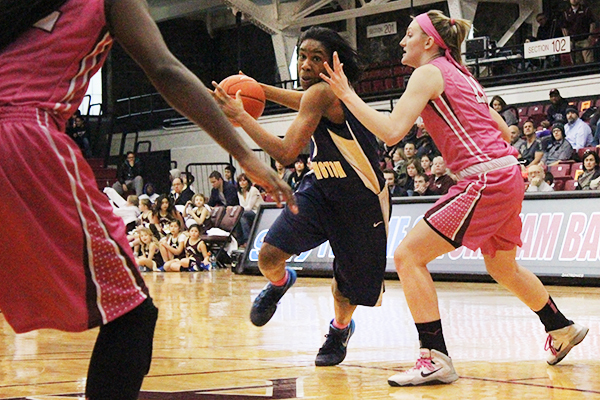 Caira Washington drives into the paint in a game last season. Washington had 23 points in GW’s win over Dayton on Sunday as the Colonials snapped the Flyers’ 31-home-game winning streak. Hatchet File Photo. This post was written by Hatchet staff writer Alex Kist. With 10 seconds left in GW’s conference opener against Dayton on Sunday and the Colonials up by one, reigning Atlantic 10 player of the year Andrea Hoover missed a layup. The Flyers had nothing left to do but foul and, as sophomore guard Hannah Schaible got to the stripe for a pair of free throws, tension hung in the UD Arena, where the crowd hadn’t felt a loss in 31 straight home games, the longest-lasting home streak in the nation. Schaible sank her freebies and the streak was over with the Colonials (12-2) topping the Flyers 69-66, stretching their win streak to 10 games on the strength of 47 points from frontcourt pair Jonquel Jones and Caira Washington. Jones earned a double-double with 24 points and 17 rebounds, leading all scorers, and Washington added 23 points and six rebounds. Though this was the first match of the season in which the Colonials did not win the rebounding margin (42-44), the posts were merciless in the paint and halted Dayton’s advances late in the second half when the game came down to the wire. GW was the early aggressor, jumping out to a 7-0 lead after senior guard Chakecia Miller converted an and-one opportunity. Yet the Flyers (9-4) bounced back with a strong transition game while the Colonials’ edge disappeared when they strangely missed several layups. Dayton had taken the lead in the first half until Schaible put up a quick shot at the buzzer to tie the match at 32 heading into the lockers. “I think the focus of the game was that we knew it was going to be two good teams that were going to make runs, and again we knew throughout the game that we needed to keep things tight,” head coach Jonathan Tsipis said. The Flyers came out hot in the second half. Dayton jumped out to a seven-point lead, 43-36, with an 11-point run, forcing Tsipis to call a timeout. The timeout proved to be effective as GW matched by going on a 10-0 run capped by a transition layup from Schaible, the type that kept missing the hoop in the first half. Tsips said the one word to describe what his team had Sunday was “poise,” as the Colonials took a bit of revenge after getting booted from the A-10 tournament in the semifinals by the Flyers last season. Dayton turned the ball over 23 times in the game, though the Colonials gave away the ball 19 times themselves. The Colonials will look to maintain their confidence and composure when they head home to host Saint Joseph’s in the second match of conference play Wednesday at 7 p.m. in the Smith Center.